Hartpury University proved too strong for Leeds Beckett University as they raced away in the final quarter to secure their third consecutive BUCS Super Rugby Championship title. After an excellent first half display from Hartpury which saw Will Biggs, Elias Caven and Max Clementson all touch down, Beckett sparked into life in the second period as Sam Theron rumbled over. Both sides then exchanged tries as Clementson and Elliot Ward scored from close range, but Hartpury were able to edge themselves out of sight. Scrum-half Toby Venner danced his way over and Ervin Muric also darted into the corner and despite Dan Grant Adamson scoring for Beckett, Nathan Chamberlain landed a late penalty to wrap up a 45-27 win and another Twickenham triumph for Hartpury. The impressive Chamberlain kicked 15 points for his side as they retained their BUCS Super Rugby crown for another year under the guidance of Sean Lynn. Leeds Beckett, who came into this final on an 11-match unbeaten run, suffered a setback before the game had even begun as star winger Chester Duff limped off during the warm-up. Kerry Wood’s side still contained an array of talent, but unfortunately for the Yorkshire outfit, they failed to impose themselves in the first period as Hartpury took control of proceedings. The holders had plenty of momentum in the forwards with skipper Biggs and flanker Clementson crossing following powerful play up front while Caven’s try came after a wonderful break by Robbie Smith before he played a simple pass to his winger who waltzed over. It was a first half performance which Hartpury would’ve dreamed about but after being outclassed at Twickenham, Beckett came alive following the break. Connor Lloyd had slotted over two penalties for Beckett in the first period, but it was fly-half Steff James who converted Theron’s score shortly after the interval. And that’s a wrap ?? The Yorkshire side were right back in the contest and even though Clementson thundered over for his second following a well-worked line-out move, Beckett kept in touch with Hartpury as Elliot Ward hungrily sought out the ball after two big carries from lock John Okafor. Leeds were now shading the breakdown - something they lacked in the first period - but despite edging the battle up front, they were unable to find a way past a disciplined Hartpury defence. Instead, the Gloucestershire outfit used all their experience to pull clear of Beckett as Venner skirted in for Hartpury’s fifth try before Muric finished off a slick move. 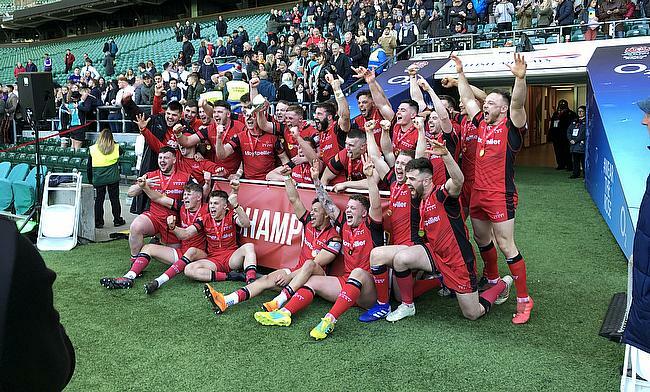 Grant-Adamson did pull one back for Beckett after a lovely line and well-timed pass from Ben Dixon, but Chamberlain had the final say as he pinged over a penalty two minutes from the end to seal an unprecedented third BUCS Super Rugby title for Hartpury. Leeds Beckett University: Kieran Davies; Harri Robinson, Tom Williams, Ben Dixon, Will Lewin; Steff James, Connor Lloyd (capt); Ryan Everleigh, Will Routledge, Xavier Valentine; John Okafor, Adrian Wadden; Jonny Teague, Toby Francis, Dan Grange. Replacements: Johan Visser, Sam Theron, Conrad Cade, Elliot Ward, Trystan Lloyd, Dan Grant Adamson, Charlie Venables, Gary Denman. Hartpury University: Jack Johnson; Elias Caven, Robbie Smith, Joe Margetts, Ervin Muric; Nathan Chamberlain, Toby Venner; Luke Boon, Will Biggs (capt), Alex Gibson; Tom Everard, Angus Southon; Will Hopwood, Max Clementson, Harry Wilson. Replacements: Jordan Liney, Ollie Atkins, Nick English, Ben Kelland, Aiden Burnett, Dan Cole, Ben George, Alex Forrester. Make sure you have a listen of our #BUCSFinals day podcast which we recorded at Twickenham!